Drawing on the universal values in health care, the second edition of Quality and Safety in Nursing continues to devote itself to the nursing community and explores their role in improving quality of care and patient safety. 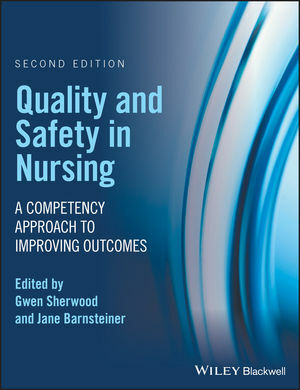 Edited by key members of the Quality and Safety Education for Nursing (QSEN) steering team, Quality and Safety in Nursing is divided into three sections. Itfirst looks at the national initiative for quality and safety and links it to its origins in the IOM report. The second section defines each of the six QSEN competencies as well as providing teaching and clinical application strategies, resources and current references. The final section now features redesigned chapters on implementing quality and safety across settings. This ground-breaking unique text addresses the challenges of preparing future nurses with the knowledge, skills, and attitudes (KSAs) necessary to continuously improve the health care system in which they practice. Gwen Sherwood is Professor and Associate Dean for Practice and Global Initiatives, School of Nursing at the University of North Carolina, Chapel Hill, USA. Jane Barnsteiner is Professor Emerita, School of Nursing at the University of Pennsylvania, and Editor of Translational Research and Quality Improvement at the American Journal of Nursing, USA.